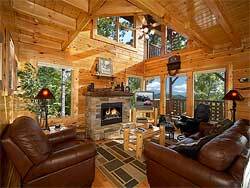 Luxury is the name of the game at Wildest Dreams Pigeon Forge Cabin rental from Majestic Mountain Vacations. When you see the interior of this beautiful vacation rental pictured to the right, you will know you are going to be pampered on your Pigeon Forge vacation. Wildest Dreams is a 2 bed 3 bath log cabin rental that will sleep up to 12 adults in 2,352 square feet of pure luxury with some great amenities to keep you entertained and comfortable on your vacation to the Smoky Mountains. If you like nice amenities and like to be pampered on your vacation then the amenities offered in this cabin at Majestic Mountain Vacations will suit you just fine. To start with they include 4 TV's with one being a 60" HDTV, 2 DVD and 2 VCR players, handcrafted log furniture, a fireplace, 5, yes I said 5 decks, a foosball table, a pool table, an air hockey table, a grill and deck furniture on the porch, cable and satellite television, a hot tub and Jacuzzi and so much more. The cabin is located close to Pigeon Forge and attractions like Dollywood, shopping in the outlet malls, dinning, and all sorts of entertainment. You are also close to Gatlinburg and its major attractions like the Gatlinburg Space Needle, Ripley's Believe It Or Not Museum and Ripley's Aquarium, Cars Of The Stars and everything else the resort town of Gatlinburg has to offer. You are also close to The Smoky Mountain National Park where you can visit Cades Cove or take a hike or go fishing or whitewater rafting in a mountain stream. Wildest Dreams log cabin rental rated range from $199 per night to $355 per night and from February 28th to May 31st you can stay two nights and get a third night for free. Check out Wildest Dreams luxury cabin rental today and plan to have the best Pigeon Forge or Gatlinburg vacation you've ever had!